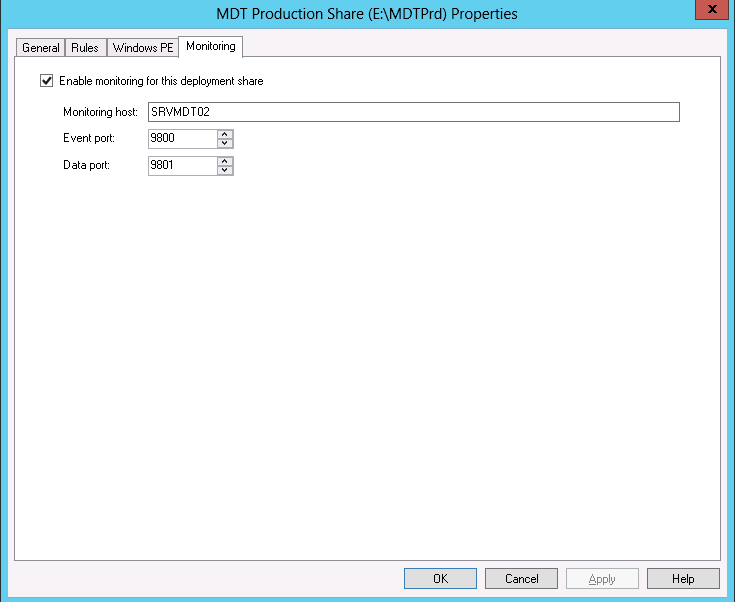 MDT 2012 gives you monitor capabilities and that is very convenient. The basic configuration is that you enable that which will then install a service and then you can use the monitor tab to see and follow the flow of installs. Here is my configuration, I’m using the default ports 9800 and 9801 and the server name is SRVMDT02. When you enable that a service will be installed (based on .Net of course) and it will also update customsettings.ini to include this setting so that the scripts know where to send data. When all is set up you can see everything in the monitor tab. But it is possible to consume the data using any method and one easy way which I have started to do is to use Excel 2013. In Excel 2013 it is possible to read OData and that is the format that MDT 2012 is providing. The benefit is that you can create more colorful diagrams, easier to have massive amount of machines, sort, bend, twist and all that. The URL is http://srvmdt02:9801/MDTMonitorData/Computers if your server is called SRVMDT02 and you are using the standard port. Select to connect to the Computers Table Finnish the connection using next-next-until-end principle and in the end select to use a table in the existing Spreadsheet. This is great Mikael. Do you know if it is possible to output this odata feed to sharepoint or something? 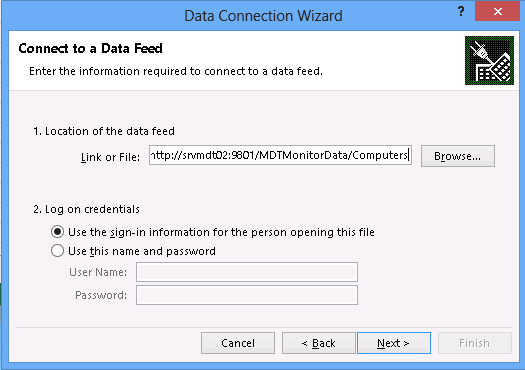 I have not done any Connections to Sharepoint, but OData feeds are easy to work with, so it should be an easy task.